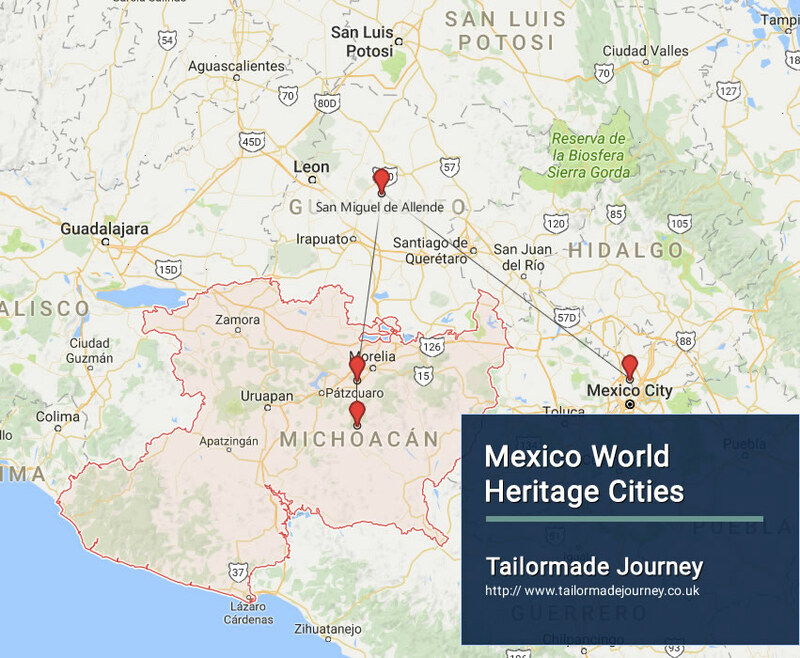 This trip visits the majority of Mexican cities that have been recognized as UNESCO World Heritage Site. In addition to visiting many of Mexico’s colonial cities, you will also have a chance to discover two Magic Towns where you will witness local customs and traditions. Arrive Mexico City 2 Nights > Drive San Miguel de Allende 3 Nights > Drive PátzcuaroPátzcuaro 2 Nights > Drive Michoacan& Leave. You will be picked up in the hotel lobby for a full day privately guided tour the Teotihuacán Pyramids famous for the world’s 3rd and 4th largest pyramidal structures, the enormous Pyramids of the Sun and the Moon. Your guide will enhance your experience with expert explanations of the importance of the site and its place in the rich history of Mexico’s many layers of pre-Columbian civilizations, your local expert guide will welcome you to these sights and offer unique insight into their extraordinary character. Enjoy lunch locally before returning to the city for a visit to the world famous Anthropology Museum. Depart Mexico City after breakfast for the colonial heartland. Your first stop awaits approx 2:20min to the northwest. Enjoy an overview city tour of World Heritage Querétaro and free time for lunch and strolling among the many Baroque monuments standing since the 17th and 18th century golden era. Travel onward to San Miguel de Allende and the charming Casa de la Sierra Nevada hotel. Learn for yourself how so many visitors from all over the world fall in love with this unique center of arts and culture. Your local expert guide will show you some of the great sights while explaining the history of the area and providing you with the knowledge you need to explore at your own pace in the evening. Lunch at the famously delicious Las Bugambilias or join a cooking class (optional extra). Overnight stay at the Hotel in Pátzcuaro. Spend a half-day visiting Santa Clara del Cobre, approx 20min away, a former copper mining town where artisanal methods continue to thrive. You will observe coppersmithing and have the opportunity to see exquisitely crafted pieces that have gained local artists recognition as far away as New York, Paris and London. Also visit communities on the side of Lake Pátzcuaro, known for art and architecture. This day may also include a visit to the ruins at Tzintzuntzan. Transferred to Michoacan Airport to board flight for Onward Journey .